what a spectacular weekend it was! There has been laughter, there have been tears, but most of all there has been suspense of epic proportions. First of alll we'd like to thank everyone for being there and making the event as unforgettable as it was. The drivers and exhibitors deserve high praise for taking part in the wreck-fest, that was the Dirt-Track Mastership 2016. 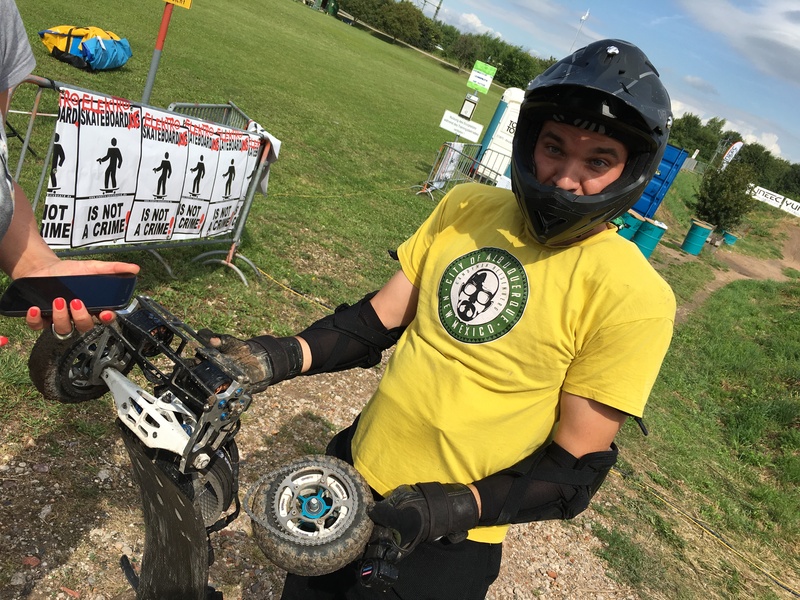 Even before the first run of the championship, there has been a catastrophic failure with a board, when Jens Kappel - doing an awesome jump during one of the trainig sessions - destroid his titanium rear axle. That didn't mean he couldn't compete however, because being such a pro, he of course packed a spare. That wasn't the only board that suffered damage. French rider, Mathieu Bach, dismantled his rear axle after a jump through the finish line in round 3 of the first run. This led to him not being able to compete in the second run. For the third and final run the other drivers managed to get a spare board up and running, so that Mathieu had a chance to improve his previous best time. A big round of applause goes out to Swiss rider Gabrielle Brunny, who, beeing 13 years old, was not only the youngest rider to compete this year, she was also the first female participant in the championship and held her own against all the male riders. Állez, Állez, Állez! The only rider cracking the 30 second milestone and therefore defending his title as champion is Jens „Jenso“ Kappel, taking only 29.62 seconds around the course. Closely behind him, only half a second slower was the Swiss competitor Nicola "Bruce-Lee" Morellini. His best time was 30.15 seconds. French rider Thomas „Toma“ Latreuille had to content himself with third place. He arrived at the competition by train mere hours before the starting signal and therefore didn't have as much time to make himself familiar with the course as the other riders. 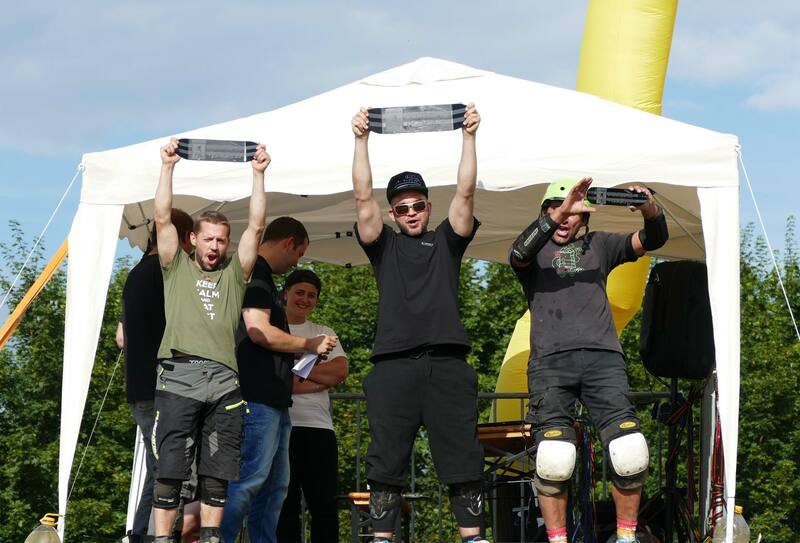 The full leaderboard of the Elektro-Skateboard Dirt-Track Mastership 2016 may be found on the Results page. like last year the event will bei streamed live to the web. However, this year there will be two streams for your viewing pleasure. All completely free! Stream 1 comes from a mounted camera pointed to the track and broadcasting during the whole event. Stream 2 Isn't always active. It's a hand operated camera capturing highlights from the Mastership. the rider registration for the mastership is officially open starting right now! Act fast, for there is only a limited number of slots in the roster. The deadline for the registration is July 17 2016, but we would like to ask you to not wait too long, so we have a chance to plan ahead. The starters fee is a very humane 10€, just like last year. So, keep on keeping on. Till the next update. Starting right now you'll be able to ogle our brand spanking new picture gallery and video gallery . But that's not all! You are even allowed to upload your own pictures and videos! Those who think they can outsource their collection of naughty pictures, I'm sorry to disappoint you. We know you. That's why new content won't be published to the website until we survey it. So, if you have pictures or videos from the last two masterships, come to the website and upload. By the way: You can rate the pictures and videos you like with a thumbs up! full of pride and after gallons of blood, sweat and tears we are able to inform you, that the website will be online starting today. I'm sure you are asking yourselves: "Is this it? ", "Where can I register?" oder "Who are you and what are you doing in my feed? ".Don't panic! This is just the beginning! So, stay tuned and visit daily. The page will be beautified heavily in the upcoming weeks. Lowered suspension and nitrous injection included..
See you everyday here and on the track in August! It is time once again! 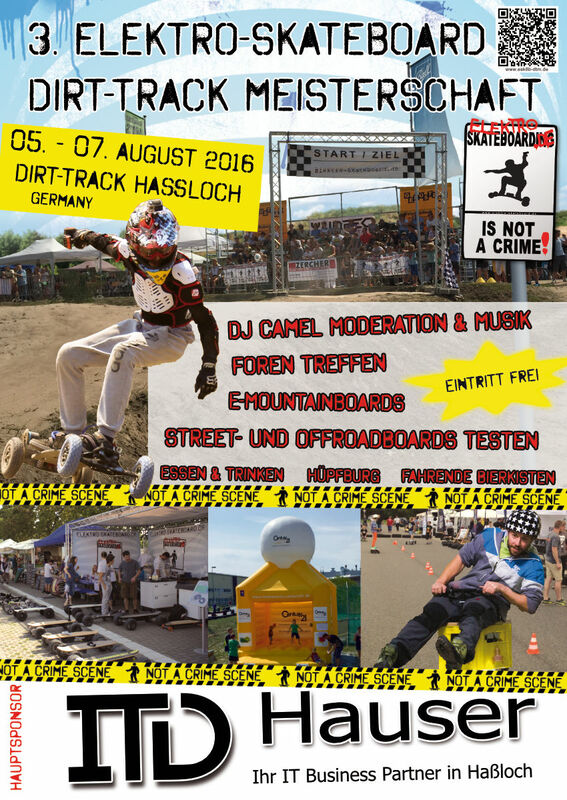 E-Skateboard riders from all over Europe will compete to bring the trophy and title of "Dirt-Track Master" to their respective country in august of this year again on the infamous Dirt-Track Hassloch. Aside from the training and competition runs, the audience can count on a lot of fun on the sidelines. Different makers and vendors of various e-mobility gadgets will be showcasing their most recent models, which will of course be available for a test drive. Our DJ will heat up the atmosphere with most recent hits and classics alike. Boredom won't stand a chance. 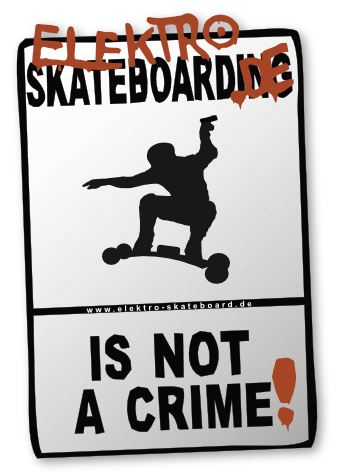 The inclined E-Skateboard fan will be offered the chance to take different boards for a spin. Both on tarmac and off road! More Information to come in the next couple of days.